<td align="center" style="padding: 20px 0 0 0; font-size: 16px; line-height: 25px; font-family: 'proxima_nova_rgregular', Proxima Nova, Helvetica, Arial, sans-serif; color: #aaaaaa;" class="padding2">Between planning, development, and approval, every brand has a different email production process—each with its own strengths and weaknesses. This survey examines the current state of email production to help marketers identify opportunities for improvement. <td align="center" style="padding: 10px 0 0 0; font-size: 15px; line-height: 22px; font-family: Proxima Nova, 'proxima_nova_rgregular', Helvetica, Arial, sans-serif; color: #1D223C;" class="padding2">The latest version of Apple’s operating system supports additional CSS properties—and offers a brand new way to interact with emails—in its native email app. However, it’s also introduced a number of quirks. How will your emails look in this updated app? <td align="center" style="padding: 10px 0 0 0; font-size: 15px; line-height: 22px; font-family: Proxima Nova, 'proxima_nova_rgregular', Helvetica, Arial, sans-serif; color: #1D223C;" class="padding2">Gmail rolled out “block” functionality to all webmail and Android users, giving subscribers yet another way to rid their inboxes of emails they don’t want. While it may not sound like a great thing for marketers, it’s not as bad as it sounds. <td align="center" style="padding: 10px 0 0 0; font-size: 15px; line-height: 22px; font-family: Proxima Nova, 'proxima_nova_rgregular', Helvetica, Arial, sans-serif; color: #155d41;" class="padding2">During the holiday season, your transactional and triggered emails will be high-performance assets. Here are five ways to make the most of these critical opportunities over the next couple of months. <td align="center" style="padding: 10px 0 0 0; font-size: 15px; line-height: 22px; font-family: Proxima Nova, 'proxima_nova_rgregular', Helvetica, Arial, sans-serif; color: #235a8b;" class="padding2">From the signup, to the email, to the landing page—and everything in between—optimizing for every step of the subscriber experience is key to email marketing success. <td align="center" style="padding: 10px 0 0 0; font-size: 15px; line-height: 22px; font-family: Proxima Nova, 'proxima_nova_rgregular', Helvetica, Arial, sans-serif; color: #235a8b;" class="padding2">Personalization isn’t just about [first _name]—it’s about understanding what drives a person’s decision-making process, where they are in that process, and placing all of it within the context of their specific challenges. Start sending personalized emails. <td align="center" style="padding: 10px 0 0 0; font-size: 15px; line-height: 22px; font-family: Proxima Nova, 'proxima_nova_rgregular', Helvetica, Arial, sans-serif; color: #235a8b;" class="padding2">Consumers don’t find brands’ emails to be as memorable as marketers think they are. Our joint research with Fluent identifies specific tactics that marketers can use to create more memorable, shareworthy emails. <td align="center" style="padding: 10px 0 0 0; font-size: 16px; line-height: 25px; font-family: Proxima Nova, 'proxima_nova_rgregular', Helvetica, Arial, sans-serif; color: #999999;" class="padding2">Over the past decade, Litmus has grown into the product and company you see today—a vital resource that is used by over 250,000 email marketers every month. We’re setting ourselves up for even bigger success in the next ten years. We’ve taken a $49 million investment from Spectrum Equity. 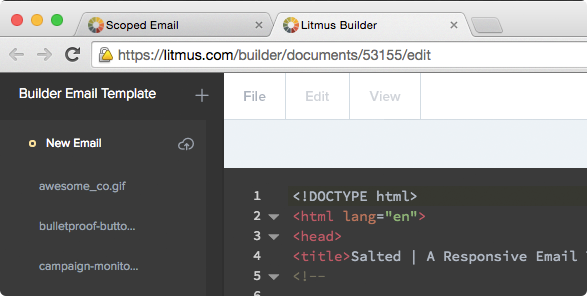 Join us as we go over what’s new for Litmus. We’ll show you how to get started testing your emails, as well as a full overview of the Builder and Checklist features. <td align="center" style="font-size: 26px; font-family: 'proxima_nova_rgbold', Proxima Nova, Helvetica, Arial, sans-serif; color: #ffffff; padding-top: 0; font-weight: bold;" id="font-weight-normal" class="padding2">Happy Halloween, email geeks!